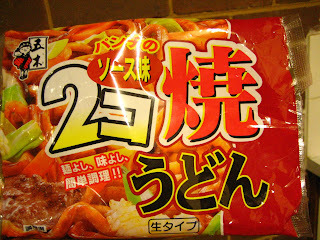 I bought a Yaki udon package... so the sauce is not my original. 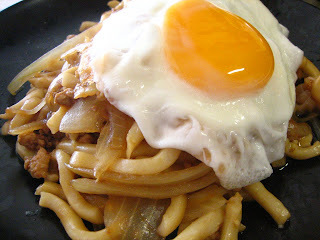 But next time, I'll invent my own sauce for yaki udon! 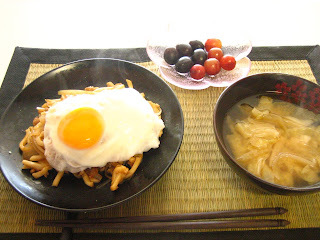 I personaly love to have a half cooked egg on the top of the yaki udon. It has to be half cooked! 1. cut the onion into thin slices. 2. heat up a pan with some oil, cook the pork and onions till onions become soft and transparent. 3. add Udon and 1/3 of water. 4. add the sauce, stir well. My housemate is taking me to a Taiwaneese restaurant for dinner tomorrow.